Julian Trevelyan was a painter and engraver born in 1910 in Dorking, Surrey. Trevelyan studied art under S.W Hayter in Paris from 1930 to 1934 and travelled widely in Europe, later settling in Hammersmith, London in 1935. He had his first one-man exhibition at the Lefevre Gallery in 1937 and was a member of the English Surrealist Group and the London Group, later teaching at the Chelsea School of Art and the RCA. During his time working at the Royal College of Art he became Head of the Etching Department, developing into a highly influential teacher, with students including David Hockney, R.B Kitaj and Norman Ackroyd. 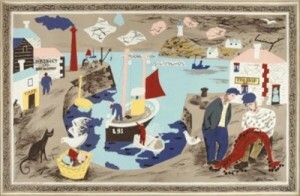 Trevelyan was married to the influential female artist Mary Fedden from 1951.